Kevin went from injured railroad worker and Client to 18-year employee of Goldberg Weisman Cairo. On May 28, 1994, Kevin was working as a car inspector for the Belt Railway Company of Chicago. While Kevin was riding in a company truck on the job, he was hit by three locomotives. Kevin was diagnosed with a bulged disk in his lower back, a very serious workplace injury. After being taken out of service by the railroad he retained Louis C. Cairo to represent him in his claim against the BRC. After his case was settled Kevin was hired as a personal injury investigator for the firm. Kevin has workplace and personal injury investigation duties which include taking witness statements, photographing accident sites and interacting on a sometimes-daily basis with clients. His previous injury as well as being a former client has helped him to present injured workers with questions and issues that they have experienced. He also travels the country attending union meetings and explaining to members their rights if they have sustained a workplace injury. Call Kevin to arrange a presentation at your next union meeting explaining the rights of the injured worker in Illinois workers compensation or FELA. Mr. Daugherty grew up in Joliet, with his Mom, Dad and two sisters. Kevin has a long family history of union membership. His Grandfather, Great-Grandfather and Great Uncle were all members of the United Mine Workers Union. His Grandfather was a member of the Textile Workers Union and his father is a 51-year member of International Association of Machinists Local 851 in Joliet. Kevin spent 8 years as a volunteer fireman in Plainfield achieving the rank of Lieutenant and then Captain before leaving the Department after moving from the district. Kevin has been a member of the Machinists Local in Joliet and of the Transportation and Communications Union while working for the railroad. He is married to Kim and has a grown son David, who is a Chicago Fire Department Paramedic and Local 2 union member and EMS union steward, in addition to three stepchildren and two grandchildren. 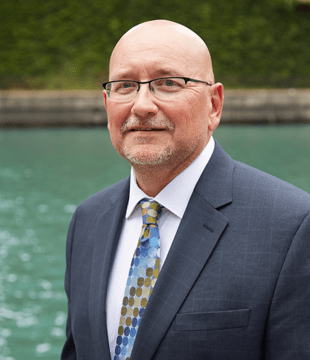 Contact Goldberg Weisman Cairo to meet Kevin and learn all about how our Chicago personal injury investigation team can help.